I apologize for the tardiness, but, as we all know, life happens outside of the Internet – always better late than never is the All Balboa Weekend vendor post, because ABW has, in my opinion, the best vendor aggregate year after year. This was my 10th ABW, if you can believe it, and the first one I couldn’t attend for the entire weekend, but I promise I crunched to maximize my time there and to give you this attempt at a comprehensive vendor post. I was given the incredible opportunity to examine Genevieve Grazis’ performance clothing, including the famous Beach Clip dress, and was invited to talk about the dress’ construction and details in front of the entire event as part of Kate Hedin and Bobby White‘s presentation and demonstration of the dress. While everyone is gaga over the 11 godets that, combined with 1930’s satin, make this dress spin like a dream (and rightly so! ), but my favorite part of this dress are the sleeves – a triple pleats, both front and back, along the arm hole seam with two piped seams straddling a panel in the middle of the sleeve. The result is a puffed sleeve created by divine architecture. 2. Coif magicians Destinee Cushing and Francine Amendola combined forces to form the Hepcat Salon, delivering incredible and pristine vintage hairstyles all weekend long. I know several people who will get their hair done and wear it for a couple of nights or most of the weekend so they don’t have to worry about doing it multiple nights and to keep it out of their faces, which I think is a great plan to maximize your ‘do and practical for a dance weekend with lots going on that you don’t want to miss. The flagship booth at ABW is always Re-mix Vintage Shoes, who makes very rare appearances at any events outside of southern California. I know people wait until ABW to buy their first (or second, or 10th) pair of Re-mix shoes so they can try them on and see how the styles fit their feet. I can’t tell you how happy it makes me to see them all in a row. Next in the lineup was Sweet Lorain, which is my favorite vintage shop in Cleveland. To call it a shop is really an understatement, it’s almost a warehouse, definitely a department store, and you can get lost in there for hours amongst the clothing, furniture, kitchen wares, records, Christmas decorations, and on. Of course, for ABW, they pull a selection of garments with dancers in mind from the 1930’s through the 1950’s so that you don’t have to do the digging, it’s already been dug out for you and is sitting in the hallway of the event. My story this year is that Andy Nishida and Rita Shiang (dancers and organizers of Richmond, VA’s Jammin on the James) had come to Cleveland a few weeks earlier for the World Congress on Art Deco and had scouted a 1920’s dress for me at Sweet Lorain. 1920’s dresses are hard for me because of my body type, so I was hesitant to phone in the purchase, even though Rita knows my size. I show up at ABW with this texted photograph of a dress and the owner, Redwin Lewis, knew the dress immediately, still had it, knew it would be perfect for me – and it was! 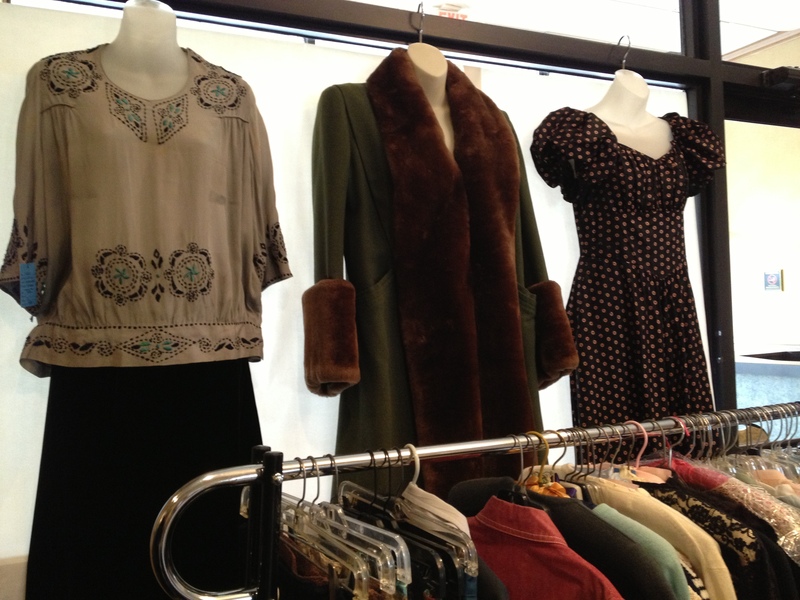 Sometimes vintage shopping is easy and sometimes it takes a few steps to find a dress a home. De Fils en Perles returned to ABW this year with even more intricate beadwork, much of it Art Deco-inspired. I was particularly smitten with the earrings this year, which were often made of an exquisite central bead with smaller embellishments and looked perfect for certain 1920’s and 1930’s ensembles. I am often overwhelmed by jewelry, so many beautiful small things at once, and I took some time to sit down and go through the earrings and really appreciate the detail that goes into each piece. Retro Rosie made its ABW debut this year and before I even got to ABW, there was a buzz that a vendor was there selling Trashy Diva. I spoke with Miranda Scott, the owner, who runs this brick and mortar shop and an online shop, that most of her sales are online. I found this unsurprising, given the specialty nature of the garments (as much as I like to think we are the norm), and was glad she gave ABW a chance. She had several Trashy Diva dresses that are discontinued in most sizes, so secondary stockists are essential for the dress you may have missed (since they TD lines are selling out within days of launch, nowadays) and the chance to try things on in person. She also had a selection of Besame Cosmetics, another item that I can’t purchase locally to me, but that I see on the internet all the time on vintage blogs and it’s great to see the colors in person and be able to try them on, as well. Jamie Sturdevant’s Chatterblossom booth is always a bright spot, with her cheery disposition, creative floral-inspired ensembles for each day, and a bevy of blooms for each possible scenario and outfit. Indecision abounds at this booth, as there are so many to choose from, so many outfits to match, so many beautiful pieces that you just want to come home with you. My favorite pieces this year are the giant lilies she acquired earlier in the year by chance, they are just so big and elegant, I want one in every color! Message her about matching one to your favorite ensemble, her Etsy listings are only the tip of the floral iceberg. Finally, at the end of the hallway are the Flower Child ladies, who also do an amazing job of curating just the kinds of vintage goods dancers and swing era enthusiasts want, and also go back to their warehouse to look for items to fill specific requests. With new things brought back every day, it’s worth a gander multiple times during the event to keep up with what is in stock. My favorite item this year, brought to my attention by Jamie and ultimately purchased by Destinee, was a chartreuse 1930’s gown studded with rhinestones, featuring braided straps and a bias cut guaranteed to flatter the figure. Destinee wore it on Saturday night and, with her impeccable hair and makeup and a Chatterblossom bloom, looked like a legit silver screen movie star – or perhaps early technicolor, because no one should hide the color of this gown! And here we are! Enjoy the photo spread below! But for serious…this chartreuse gown from Flower Child is everything! Thanks to Destinee Cushing for allowing me to use this photo. A sun-speckled display at the Flower Child booth. Ladies hats, ladies things…at Flower Child. A gorgeous 1940’s rayon print dress at Flower Child. Bathing suit…romper…whatever you want…at Flower Child. A waistcoat and some men’s accessories at Flower Child. Lilies, roses, and blooms about at ChatterBlossom. A purple and white orchid at ChatterBlossom. Oh, God, I’m terrible at botany – I don’t remember what these are, but they looked like they were dappled in frost, just so lovely – at ChatterBlossom. A sight for sore eyes – gorgeous Besame Cosmetics on display at Retro Rosie. Vintage hairstyling books and Trashy Diva at Retro Rosie. Trashy Diva, alive and in person – at Retro Rosie. Perfect summer cropped top at Sweet Lorain. What even is this magical woven trim detail on this dress? At Sweet Lorain. 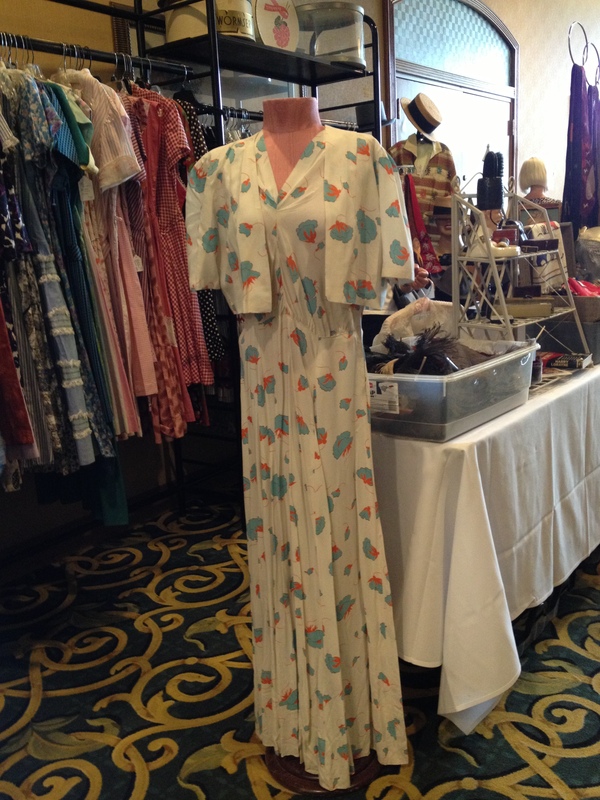 A sweet 1940’s rayon print long sleeved dress at Sweet Lorain. Bakelite abounds at Sweet Lorain. 1940’s neckties at Sweet Lorain. More delicious details at Sweet Lorain. Minty fresh color on this comfy men’s shirt at Sweet Lorain. One of many awesome sweater vests at the Sweet Lorain booth. 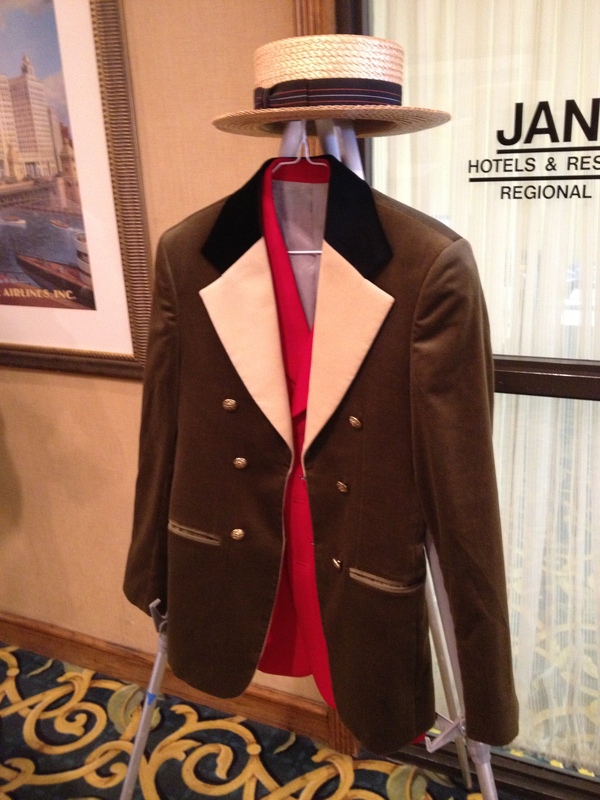 A summer starched topper at Sweet Lorain. Men’s selections at Re-Mix Vintage Shoes. Knots divine at Re-Mix Vintage Shoes. Beaded sets at De Fils en Perles. All this wonderful detail, handmade, just incredible – at De Fils en Perles. Short and sweet – one of my favorite pairs of Remix Shoes, the Anita in green, has popped up on eBay in excellent used condition, size 7.5, priced to move at $74. If they were a 1/2 size smaller I’d pick them up as a backup pair! 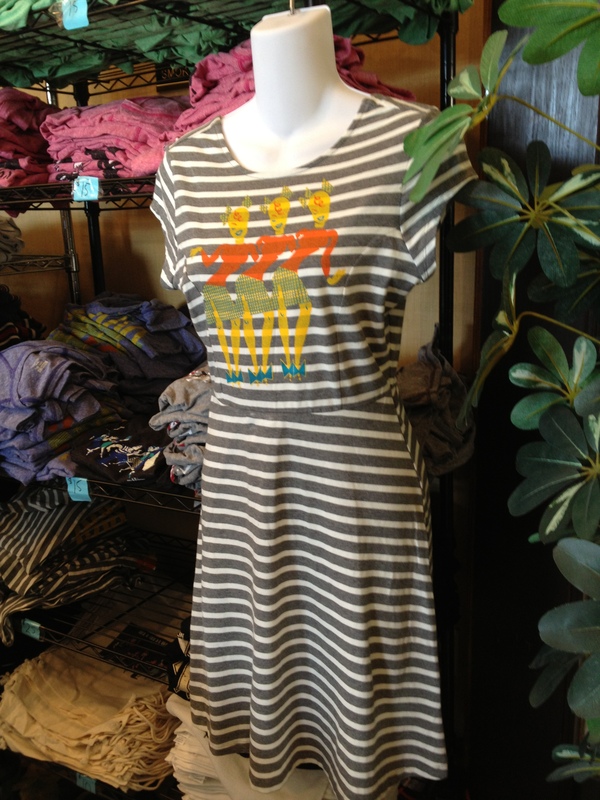 Lots of new merch at ABW this year, including this comfy dress. I think it’s safe to say that All Balboa Weekend has the best vendor setup for any event in the United States. 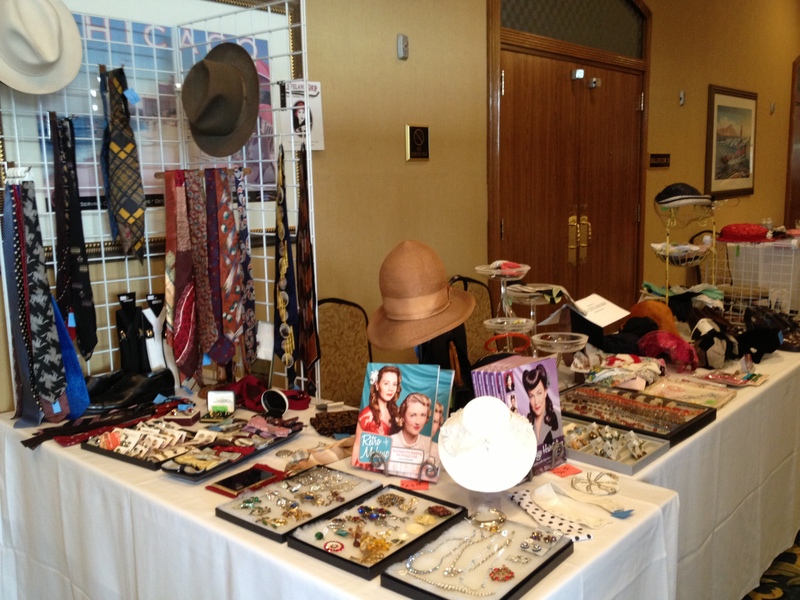 With veteran vendors and a few new ones, this year was a good year to bring a little extra to spend at ABW. The crown jewel at ABW is always Remix Vintage Shoes, who makes their only swing dance event stop here – you can try on that new style you spotted on the website, get that pair of Balboas you’ve been eyeing on any number of Bal follows, and this year they even took pre-orders so that you could be sure to get the style, color, and size of your choice and have them held for you at the booth until you pick them up. Owner Philip Heath was always helping someone with a pair, either giving advice or giving an opinion after they try them on, and he was at the booth until the wee hours of the morning. The demand is so high for these shoes that he pays to ship them from California and flys himself to Cleveland, hundreds of pairs just waiting for the right foot to take them home. Philip also told me that Remix was also working on revamping the website, so that’s good news for everyone! The accessories display from The Cleveland Shop. Making their return to ABW were the ladies of Flower Child, a vintage store in Cleveland that has many contributors, and The Cleveland Shop, which had a nice selection of 20’s through 40’s. The ladies set up an impressive display of menswear, womenswear, accessories, shoes, jewelry, sewing notions, and Flower Child even had a large display of hats that would be appropriate for the Saturday night theme “A Night at the Races.” It was a race to get down there at get the goods at 5:00 p.m. on Thursday when the vendors opened, before it got picked over. Thankfully, the Flower Child and Cleveland shop ladies would replenish some of the supplies throughout the weekend, which I love about them – you never know what they are going to bring back the next day, and don’t be afraid to tell them what you are looking for because they may bring back that very thing! 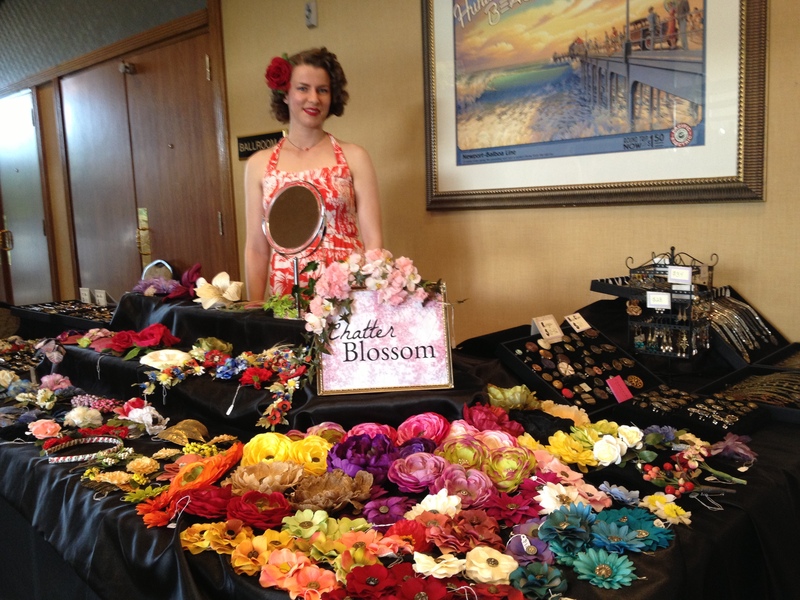 On the new vendor front is a vendor who is near and dear to me here in North Carolina, ChatterBlossom (aka Jamie Sturdevant) who runs a fantastic Etsy shop for her handmade blooms and jewelry, as well as vintage accessories. What sets Chatterblossom apart are the vintage millinery blooms she uses to make some of her hair pieces – the colors are so RIGHT, especially when you see the color wave across the hall on the Flower Child clothing racks, you just KNOW that these blooms are vintage. I know she did well because her supplies of vintage flowers were dwindling by the end of the event. 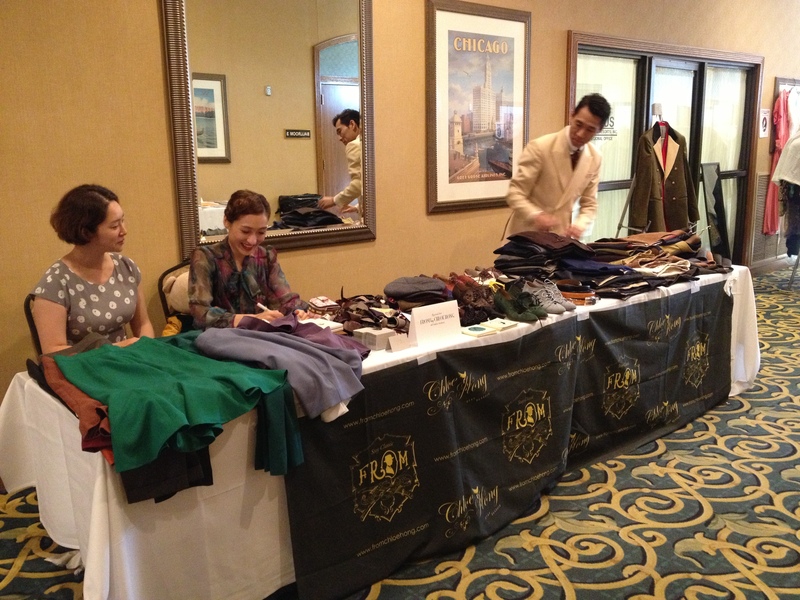 Chloe and her team at the samples table. Finally, we have FROMChloehong, who has taken the swing fashion world by storm, first with her trumpet skirts (MY storm), then with reproduction Whitey’s Lindy Hoppers jackets that she produced and took orders for especially for Frankie 100, then with her stellar showing of tailored menswear at the Frankie 100 fashion show. Chloe was on hand with sample skirts and menswear for people to try on for custom orders – there were so many more styles and colors available than I’ve seen on her Facebook page, and swatch books of fabrics that I just wanted to hold and touch and flip through to marvel at the options. I can tell you that we are just scratching the surface on what Chloe Hong is capable of accomplishing! And that’s a wrap! Cheers to you, shoppers, for continuing to support these businesses and All Balboa Weekend! Goodies from The Cleveland Shop on display. Flower Child’s end of the hallway display. A dapper Gene Kelly-inspired look by FROMChloehong. 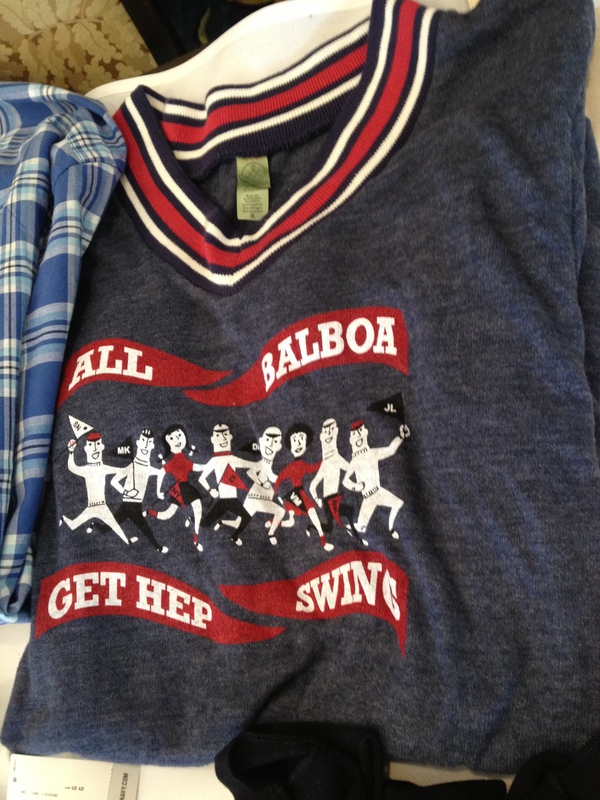 A popular pullover from the merch table – very collegiate. Newly spotted: a listing on eBay for Remix’s “Avenue” shoe in olive green and dark brown, size 9. There are two bids already, but the price is still low at $32.00. 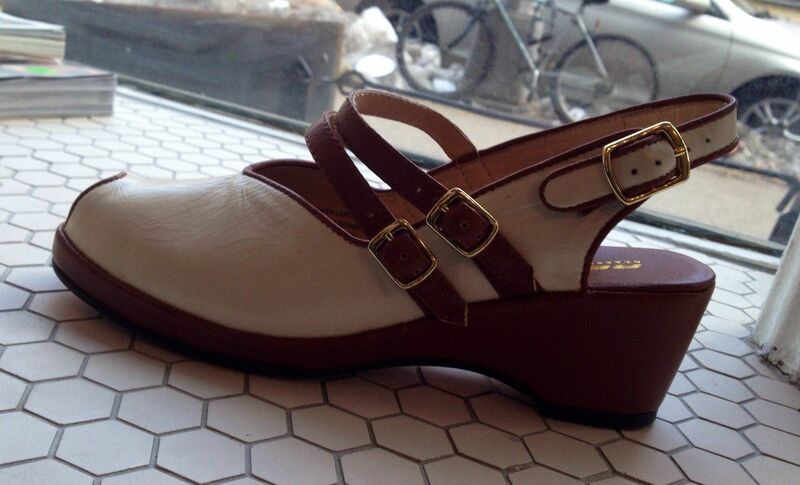 Also spotted, but not for the dance floor, a pair of Remix “Gilda” platform wedges in bronze, size 7, new in box!